Giovanni Boccati (also Boccatis or Boccato da Camerino) was an Italian painter, active in Umbria. He obtained citizenship in Perugia in 1445. Initially he was influenced by the Florentine masters Lippi, Fra Angelico and Uccello, amongst others, later by the Sienese, in particular Domenico di Bartolo. 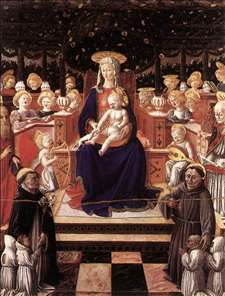 See more details about "Virgin and Child with Saints"